Traditionally, an internship programme runs for a period of 12 months. However, five months into her contract, the organisation appointed her permanently as a technician. 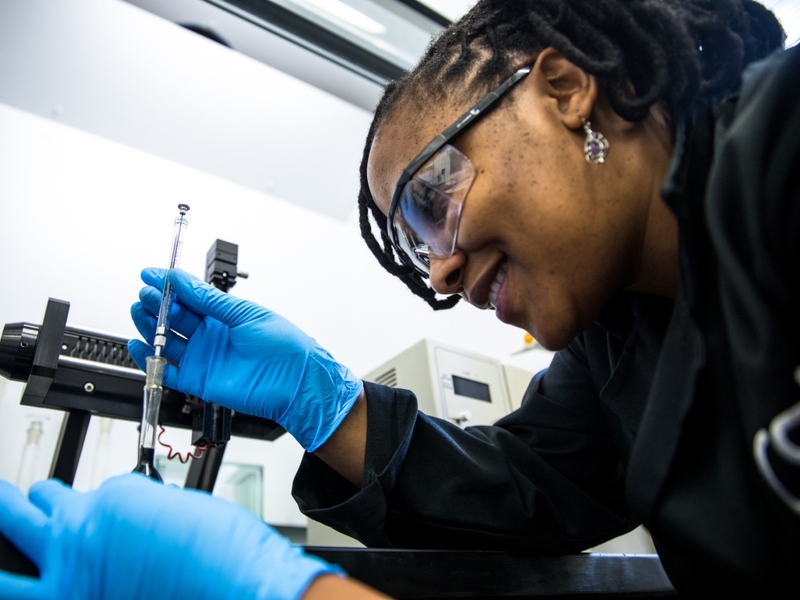 “I suppose I had made a good impression on my bosses, so I became the first black female technician in the lab,” she says. The mother of two worked as a lab technician for a number of years before leaving to venture into business. When she left the organisation, she was a senior lab technician. Her unmatched work ethic led to her being regarded as one of best in the industry, which was part of the reason the CSIR called her back, even though her business had taken off and was doing well. What began as three days of part-time contractual work soon became five days of full-time duties. Fast-forward to today, she is now managing two laboratories – the Bituminous Binders and Asphalt labs. The two labs are a part of the Advanced Material Testing Laboratories in the Built Environment. The CSIR Binders lab focuses on testing the physical and chemical properties of pure bitumen, while the asphalt lab concentrates on road performance properties of asphalt specimens produced using various mix designs. The main focus of these labs is quality, hence ISO 17025 compliance is key. The work done in the Binders lab has led to new testing methods, manuals and specifications adopted by industry. Under her leadership, the lab championed the microstructural analysis of polymer modified bitumes (PMB’s) using epi-florescence microscopy. “This has never been done in South Africa before,” she says. The CSIR Bituminous Binder’s lab is unique to South Africa and Africa in general in terms of technical expertise and testing capabilities. Mogonedi mentors students and interns on lab testing-related matters. In addition, she trains technicians and engineers from industry on new test methods and specifications. She recently returned from training testers at the Chevron refinery. “The mentoring and training contribute to my growth. I hate being stagnant,” she says. She also trains local and international clients from both the private and public sectors on new testing regimens. As for the labs in general, their role is to support cutting-edge research for South Africa and the region. In forensic investigative projects into road failures and new research into innovative new methods or products, they support researchers of the unit. Upon completion of those research studies or investigations, researchers publish their outcomes. For new methods and specifications, what normally follows after the research is the adoption of the methods or specification by industry. “This is the reason why these labs are central to the development of the industry locally and continentally,” she says. Similar labs out there are commercial and do not conduct research projects to the extent that the CSIR does. Mogonedi attributes her career growth to three things – patience, perseverance and willingness to learn. She calls herself an all-rounder because she knows how to use different pieces of equipment and techniques, and she can conduct different tests according to different specifications for the local and international asphalt pavement industry.